Motorcyclists in Maguindanao, Philippines, ride past a campaign poster of Andal Ampatuan Sr., who is in jail on murder charges. Editor's note: Sheila Coronel is the director of the Toni Stabile Center for Investigative Journalism at Columbia University. She is a co-founder of the Philippine Center for Investigative Journalism, Committee to Protect Journalists board member and author and editor of more than a dozen books. She is a 2003 recipient of the Ramon Magsaysay Award, Asia's equivalent of the Nobel Prize. (CNN) -- The irony is often lost on Filipinos. How can the country that gave the world not one, but two, peaceful "people power" uprisings that ousted corrupt regimes have such violent elections? These incidents merited only a few paragraphs in Manila's free-wheeling newspapers. Violence is part of the fabric of Philippine elections, and a murder or two seldom gets headline treatment. Last November, the private army of a powerful local clan in Maguindanao province attacked a convoy of vehicles on a provincial highway, killing 57 people, 30 of them journalists. The massacre was intended to prevent the clan's rival, Esmael Mangudadatu, from filing his candidacy. It was so cold-blooded and so gruesome that it shocked even those who had become inured to the violence of politics and daily life in the Philippines. The Ampatuan family, which has been accused of masterminding the massacre, has dominated local elective positions in Maguindanao for years and become rich in the process. In recent months, investigative journalists have had a field day documenting the family's 28 mansions, their fleet of luxury vehicles and private arsenal of high-powered firearms. "The Ampatuans do not have plantations. They do not own factories," said Albert Alejo, a Jesuit anthropologist, at a forum of religious leaders in Mindanao. "Bullets are not harvested from crops. Where did they get these from?" Over the years, the government of President Gloria Macapagal-Arroyo has showered billions of pesos to fund development in Maguindanao, one of the country's poorest provinces. 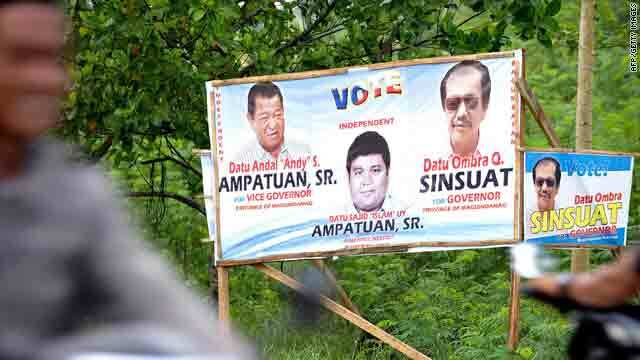 In exchange, the Ampatuans have delivered votes for the president and her party. But the province has little to show for that money: It has only 18 government doctors for over a million people and one of the lowest literacy rates in the country. Like many political families elsewhere in the Philippines, the clan has preserved its dominance through a combination of patronage, intimidation and links to the presidential palace. Officials say that the Ampatuans kept a 2,000-strong private army, which included the over 100 men who are now facing murder charges for last year's massacre. Six Ampatuans are in prison for their alleged complicity in that massacre. Despite this, at least 23 family members are reported to be running for local office in Monday's elections. The family patriarch Andal Sr., currently jailed for multiple murder, is seeking the vice-governorship of the province, running against his own daughter. The Ampatuans are an extreme example - most political families in the country do not wield such hegemonic or terrifying power. But they do show how the dynastic nature of Philippine politics has reached such absurd heights - or depths. The leading presidential candidate, Benigno "Noynoy" Aquino III, belongs to a family that has held public office for four generations. His mother, the late Corazon Aquino, was the country's first female president. And those leading in the senatorial races -- including Ferdinand Marcos. Jr., son of the former Philippine dictator -- are part of the country's entrenched political clans.